A new Hearthstone card was revealed late last night that could inspire a whole new Mage archetype. Cards from Hearthstone's next expansion, The Boomsday Project, will be revealed by the community over the coming days so players can begin to theory craft what decks they'll play when the expansion goes live. 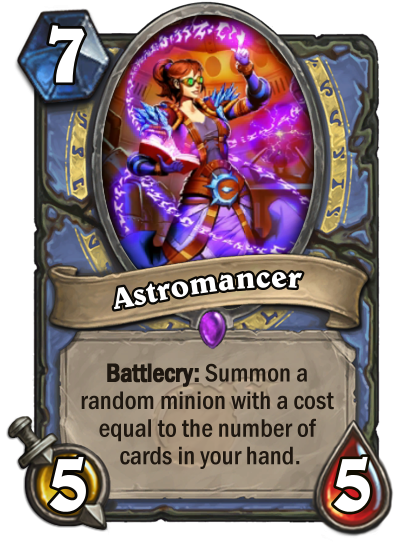 Astromancer is a seven mana 5/5. When it's played, it will summon a random minion with a cost equal to the number of cards in your hand. The mechanic is very similar to Spiteful Summoner. Instead of using a random spell for the cost, Astromancer uses your hand size. This will definitely be tried in a slower Mage deck, perhaps something similar to a Spiteful deck before that got nerfed. That could be an issue for this card too, as the seven mana Spiteful Summoner has proved to be nowhere near as popular.